« HOW TO: Reclaim Cisco UCS Chassis ID? 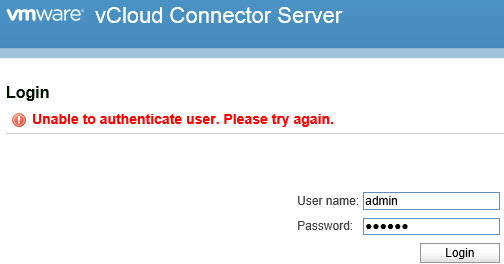 I had to re-visit a vCloud Connector environment I built quite a while ago but could not login to neither VMware vCloud Connector Server nor Node with the admin account. I was sure that I did not change the default password (vmware) so was the customer. I also checked that admin account was not locked out – see “HOW TO: Unlock admin account in vCloud Connector Server / Node” blog post for details. After a bit of goggling I found Marek Zdrojewski’s post “How to upgrade vCloud Connector 2.5 to version 2.6” that mentions that VMware vCloud Connector Server / Node admin password may have expired. I did not want to change the default password and therefore reconfigured admin account to stop it expiring. Login to vCCS/vCCN as root and use chage command check current admin account aging.